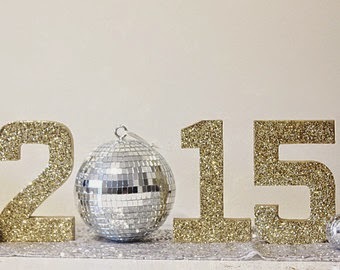 With New Years Eve approaching brings the inevitable celebrations with glitz, glamour and sparkle to mark the new year. So what better time to showcase the many places you can purchase all the glittery wonders we use in our art? There are I'm sure thousands of different sources and articles for everything that sparkles, so I apologize right now for not taking a whole month to find and list them all! ;) Here are the ones I remember for sure, plus some other things that I thought were interesting. I have NOT verified all of the below resources as being reputable companies. Please do your own research before purchasing from any of them. Importer of unique products for artists, crafters and designers. This place has some fun glitter and colors. Huge selection of Swarovski crystals and beads. Get a wholesale account if you can for those large jobs. U.K. based giant glitter and flutter glitter. You may want to get a wholesale account here to gain access to all of there many mica colors, flakes and tiles. This term refers to the average thickness which a manufacturer has deemed as the standard for gold leaf. This standard may vary from one manufacturer to another. One gold beater's regular may be thinner than the regular leaf of another brand. Surface gold leaf may have a few irregularities and is often used where double gilding is required or the leaf will be distressed or toned. A book of loose gold leaf is assembled by placing each piece of gold leaf between pieces of thin rouged paper. The gilder can then remove one leaf at a time without disturbing the remaining leaves. It is removed from the book with a gilder's tip, a flat natural hair brush. This term applies to gold leaf which is selected for it's higher quality having fewer pinholes and irregularities. Double gold does not mean that the leaf is two times thicker than regular leaf. Double leaf may be only 10% to 20% thicker than regular gold leaf. Double means that it is heavier than regular. 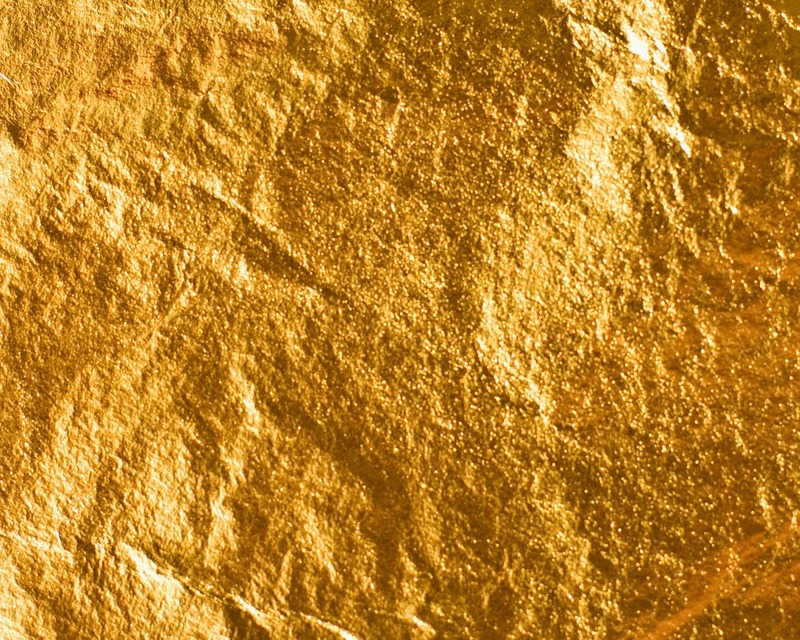 Patent gold leaf, also referred to as transfer leaf, is gold leaf mounted to special tissue paper by a pressure process. A book of patent gold leaf is assembled by placing each unit of gold leaf and tissue paper between pieces of thin rouged paper. The gilder can then remove one leaf at a time without disturbing the remaining leaves. Patent leaf is removed from the book without the aid of a gilder's tip. The leaf will stay on the tissue until it is pressed onto the prepared surface and the tissue backing is removed. This form of gold leaf is necessary for outdoor work or where conditions would make loose leaf unmanageable. Patent gold leaf is not suitable for water gilding and is best suited for flat surfaces. Gold leaf, copper leaf, silver leafing & gilding supplies including edible gold flake. 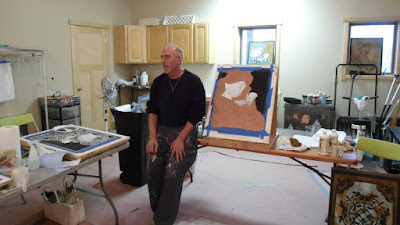 We also provide tutorials on how to gold leaf and comprehensive gilding. 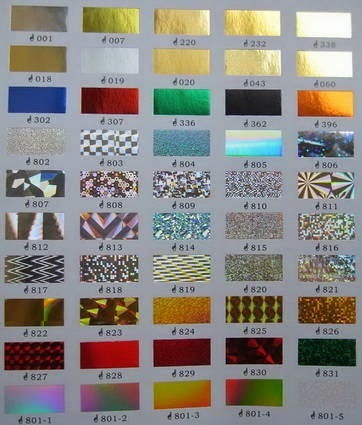 Suppliers of gold leaf and supplies, imitation leaf, and gold leafing kits. large array of genuine gold and metal leaf, gilding tools and supplies. How Can You Tell the Difference between Mica Flakes, Pyrite Flakes, and Gold Flakes? Take tweezers and bend one. Gold will bend, but pyrite and mica usually will not. If the flakes shatter or break, they aren’t gold. Gold will simply bead up. Note that if you don’t bend it far enough, mica might spring back since it does have SOME flexibility. If you poke pyrite or mica flakes with a pin, they will usually break apart into even smaller flakes, whereas gold will dent and spread like soft lead. Rub the flakes between your fingers. If they disintegrate, they aren’t gold. Gold flakes will still look like gold in the shade whereas pyrite and mica won’t. If you scratch a larger piece of pyrite, it will produce a sulfur smell. Gold is a metal, pyrite and mica are not, so see what your metal detector has to say! However, keep in mind that the detector won’t always detect flakes because they’re so small. Gold shines, but pyrite and mica (due to their crystalline structure) tend to be more glittery in appearance. 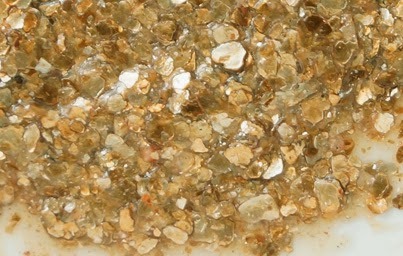 In the sunlight, gold nuggets or flakes will continue to shine as the specimen is turned to different angles and remain the same color. Pyrite and mica will glitter as the different sides of their crystal-like structure reflect light differently. They will also change color when tilted in a different direction due to its color coming from reflected light.